Here's a close-up from the ad about how to cut butter bills - by mixing your "good" butter with milk, water, and Knox Gelatine to double your amount of butter. 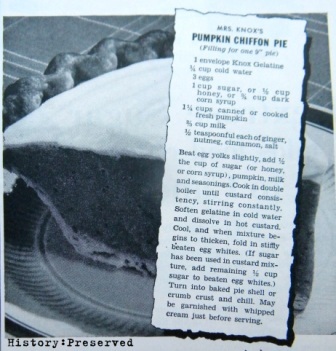 I've tried this recipe before. It really does double your butter, but it also gives it an... interesting texture. 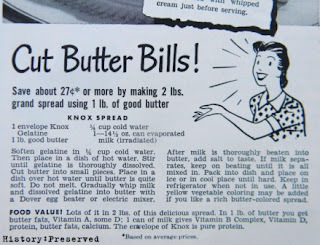 But in wartime, stretching that butter ration was important! Here's the little blurb about the pie. Yum! 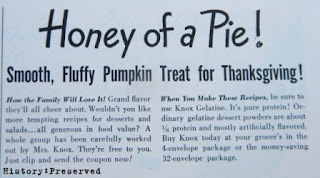 And, finally, the recipe! Notice, they suggest other options for sugar, because using 1 cup is a lot! What do you think? Would you try this one?